Mintle-e-da-us (Wade Stephen Baker) was born in Vancouver, British Columbia in 1956. His Kwakiutl native name is Mintle-e-da-us which means place of plenty. His mother is high ranking nobility of the Kingcome Inlet people, Kwakiutl Nation, British Columbia. 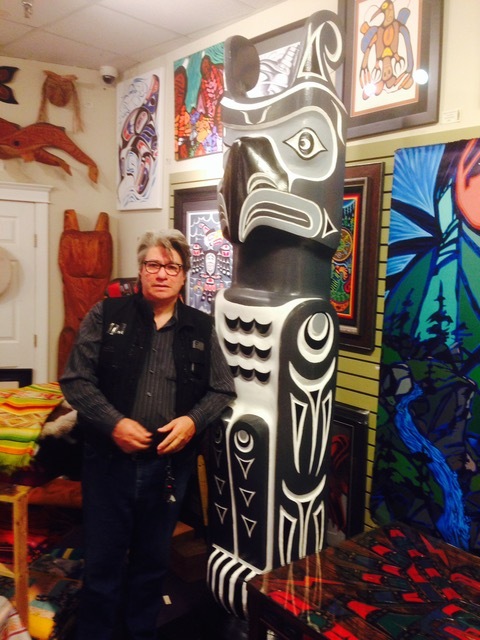 His late father, descended from Chief Capilano, was Coast Salish, Squamish Nation. Wade lives with his partner/wife, and daughter in N. Vancouver. Wade is a self taught artist who was inspired as a child by watching his relatives Mungo Martin and Henry Hunt, master carvers. His understanding of the deep spiritual and religious meaning of traditional ceremonies comes from attending his family's many potlatches held in various longhouses along the coast. His complex and detailed artistry, combined with brilliant colours, create spiritual forms that appeal to both traditional and modern collectors. Click to view Wade's glass pieces and prints.